How Do You Set Up VOIP Phone Systems For A Cordless Phone? A lot of people still have wired phone line based systems in their homes, and most businesses will reply heavily on such communications technology. Mobile cell phone technology has certainly been able to provide great flexibility, but for some people the reliable quality of a phone line is still very important. However, by setting up a VOIP phone system you will be able to greatly save on your phone bills and in many cases practically eliminate bills altogether. To this day, phone service providers still charge quite a high rate for providing wired phone lines into residential and commercial premises. If you have a small business that requires the ability to make multiple incoming and outgoing phone connections then you will quickly face a significant bill for line rental. Voice-Over-IP (VOIP) is a technology that has been around for quite some time, but up until recent years it was still very complex and expensive to set up for small businesses or households. Most consumers have probably got experience with Skype, which is essentially a phone service that allows user to make phone calls through their computer. The great thing is that if you connect from one Skype account directly to another, then the call is free. But there are numerous other VOIP providers on the market which all have their merits based on features and services, quality and of course prices. The great thing is that if you have a cordless home phone then you do not need to buy a new device in order to get a VOIP phone system. 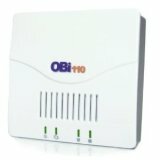 One of the best devices we have found are the conversion boxes by Obihai. These are ideal for the home and small business and provide great flexibility to the buyer. These are the basic models that are most suitable to home use or for small businesses. What they will allow you to do is use your home broadband connection to hook up to the conversion box. You can then configure the conversion box to use with Google Voice, ObiTalk or many other VOIP services. In total you can have 2 VOIP services plus ObiTalk configured. All you then need to do is hook up your cordless phone system to the Obi conversion box and you are ready to go. The set up with Google Voice is particularly great, because at present the service provides for free phone calls to USA based phone lines. 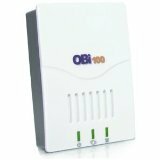 Other than the $10 price difference the main distinguishing factor between the OBi100 and OBi110 is that with the latter you can also hook up your regular phone line to bridge calls between the phone line and VOIP service. This device is more suitable to the small business as the conversion box functions as an internet LAN router and has 2 built in phone ports. In addition you will be able to configure up to 4 VOIP services along with the ObiTalk feature set. Again, you can set up Google Voice or other providers to minimize your communications costs. A VOIP phone system has huge benefits and thanks to Obihai it is now very easily possible to get up and running even in the home environment. For less than $50 you will be able to get rid of your standard phone service provider, especially is you have a wireless broadband internet connection. AGE-RELATED EYESIGHT LOSS – HOW TO DEAL WITH IT? What Is DECT Technology All About? How Do You Choose The Best Cordless Phone For Seniors? PhoneForHome.com is a participant in the Amazon Services LLC Associates Program, an affiliate advertising program designed to provide a means for sites to earn advertising fees by advertising and linking to Amazon.com.